I was heading out for a friends birthday and I wanted to make my nails pretty. Add to that my mum n dad were only home from Marmaris and had picked me up some new Golden Rosé polishes that I was itching to try out. I started with a neutral base of Nails Inc - Porchester Square. 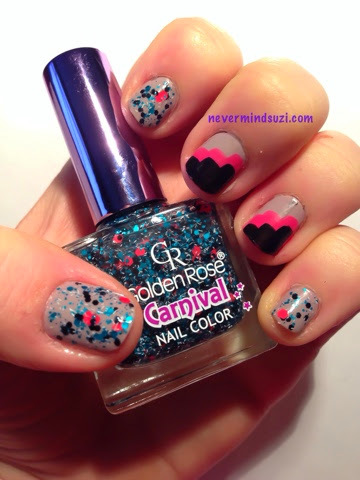 I then topped with Golden Rosé - Carnival (12). 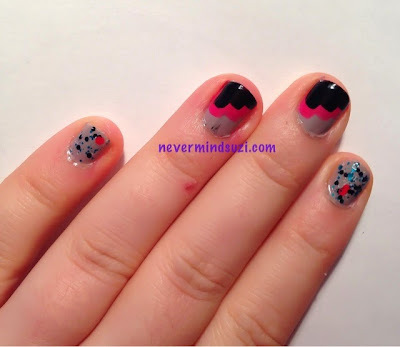 This is a textured glitter with black, white, pink and teal hexes and bars. I left my accent nails glitter free Nd instead went Art Deco/Cloud themed on them. 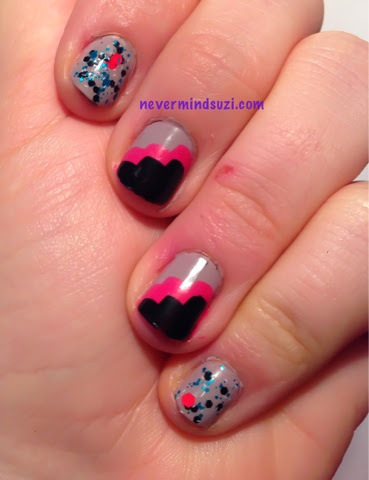 Using Sunful Colors - Creme Pink and Black on Black. I love the Art Deco look, it's fun but classy! Is this my mojo coming back?